This article is about the political concept. For other uses, see Fourth Reich (disambiguation). The term "Third Reich" was coined by Arthur Moeller van den Bruck in his 1923 book Das Dritte Reich. He defined the Holy Roman Empire (962–1806) as the "First Reich", and the German Empire (1871–1918) as the "Second Reich", while the "Third Reich" was an ideal state including all German peoples, including Austria. In the modern context the term refers to Nazi Germany. 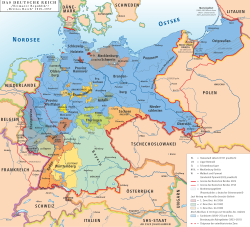 It was used by the Nazis to legitimize their regime as a successor state to the retroactively-renamed First and Second Reichs. The term "Fourth Reich" has been used in a variety of different ways. Neo-Nazis have used it to describe their envisioned revival of an ethnically pure state, mostly in reference to, but not limited to, Nazi Germany. Others have used the term derogatorily, such as conspiracy theorists like Max Spiers, Peter Levenda, and Jim Marrs who have used it to refer to what they perceive as a covert continuation of Nazi ideals. Neo-Nazis envision the Fourth Reich as featuring Aryan supremacy, anti-Semitism, Lebensraum, aggressive militarism and totalitarianism. Upon the establishment of the Fourth Reich, German neo-Nazis propose that Germany should acquire nuclear weapons and use the threat of their use as a form of nuclear blackmail to re-expand to Germany's former boundaries as of 1937. Based on pamphlets published by David Myatt in the early 1990s, many neo-Nazis came to believe that the rise of the Fourth Reich in Germany would pave the way for the establishment of the Western Imperium, a pan-Aryan world empire encompassing all land populated by predominantly European-descended peoples (i.e., Europe, Russia, Anglo-America, Australia, New Zealand, and White South Africa). Some commentators in various parts of Europe have used the term "Fourth Reich" to point at the influence that they believe Germany exerts within the European Union. This perspective has gained particular traction in the United Kingdom in the run up to Brexit and the current negotiations. ^ Reitman, Janet (2 May 2018). "All-American Nazis: Inside the Rise of Fascist Youth in the U.S." Rolling Stone. Retrieved 28 November 2018. ^ "Conspiracy theorist discussed 'Fourth Reich' in final interview". Evening Standard. Retrieved 28 November 2018. ^ Schmidt, Michael The New Reich—Violent Extremism in Germany and Beyond, 1993. ^ Goodrick-Clarke, Nicholas Black Sun: Aryan Cults, Esoteric Nazism, and The Politics of Identity New York: 2002--N.Y. University Press, See Chapters 4 and 11 for extensive information about the proposed "Western Imperium"
^ "The Fourth Reich is here - without a shot being fired". The Daily Telegraph. 15 May 2016. Retrieved 12 February 2017. ^ "Merkels Tyskland - Fjärde Riket?" (in Swedish). 4 May 2016. Retrieved 15 November 2018. ^ "'The Fourth Reich': What Some Europeans See When They Look at Germany - SPIEGEL ONLINE - International". Der Spiegel. Retrieved 12 February 2017. ^ O'Toole, Fintan (16 November 2018). "The paranoid fantasy behind Brexit | Fintan O'Toole". The Guardian. ISSN 0261-3077. Retrieved 28 November 2018. Marrs, Jim (2008). The Rise of the Fourth Reich. New York: William Morrow. ISBN 9780061245589. This page was last edited on 19 April 2019, at 16:52 (UTC).